River birch is also known as red birch, water birch, and black birch. It grows to a height of up to 75 feet, with a trunk diameter of up to 2 feet. The trunk is often divided into several arching branches resulting in an irregular, but rounded crown and an overall graceful, nearly vase-shaped silhouette. River birch grows primarily in the southeastern quarter of the United States. Its range extends north from southeastern Texas to Iowa, southeast along the western edge of Illinois, through southern Illinois across to Virginia and southward to northern Florida. In Illinois, it occurs on floodplains and on slopes associated with the major streams and rivers. It also occurs in scattered sites along streams in Wisconsin and Minnesota in the north and the middle New England states. River birch is a streamside tree, growing best in alluvial soils (deposited by water). Whereas it requires high soil moisture and grows best where relatively high soil moisture is maintained throughout the year, it doesn't tolerate heavy or prolonged flooding. Although river birch prefers moist soils, it occasionally becomes established on drier soils, particularly near the western edge of its range. River birch is tolerant of very acid soils (pH 2 - 4), and is used in strip mine reclamation where the soils have become acid as a result of mining wastes. It is the only spring-fruiting birch and the only native birch whose range includes the southeastern coastal plain. River birch does not tolerate shade, a characteristic of "pioneer" species (plants that are the first to colonize an open habitat). It is one of the first species to colonize streamsides and sandbars when flood waters recede because it produces many seeds which germinate quickly and its seedlings make rapid growth in early development. During early stages of growth, the seedlings have a high soil moisture requirement, but neither seedlings nor mature trees can survive flooding that lasts well into the growing season. River birch bark is reddish brown or pinkish-brown and smooth on the youngest twigs, becoming shaggy (peeling and curling) and either reddish-brown, yellowish-brown to gray-black on older trees. The twigs are sometimes rough and warty, slender, and reddish-brown, with sparse hairs. The buds are up to 1/4 inch long, narrowed at the base, pointed at the tips, and hairy. The leaves are alternate, simple, triangular/oval, and coarsely doubly toothed at the edges. They are pointed at the tip and are up to 3 inches long. The undersides of the leaves are hairy, especially along the veins, and paler than the surface of the leaves. 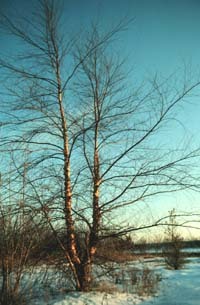 River birch is monoecious, with both male and female flowers borne separately, but on the same tree. Male flowers appear as slender, drooping catkins, female flowers in short, conical, woolly clusters. Flowers are inconspicuous, appearing in April - May. Fruits are small, nuts covered with hair, each having a three-lobed wing. The fruits occur in groups, crowded into a cylindrical cone up to 1 1/2 inches long. The seeds are released in early summer and germinate quickly. Because of its graceful silhouette and attractive bark, river birch is a highly prized ornamental. It is also planted for erosion control and in mine reclamation because of its tolerance to acid soils. River birch wood is strong, but light, making it ideal for the manufacture of children's toys and artificial limbs. The wood is also used for inexpensive furniture and basket hoops. Birds eat the seeds and deer browse the foliage. Native Americans used river birch medicinally to treat dysentery and colds.